Patricia and I have a friend we call Diva Jess. She's works in the fashion industry and always gives us the scoop on what the trends are. She came into the shop like a storm a few weeks ago and told us that we HAD to cast on righthisverymoment for an infinity scarf. "They're Everywhere! ", she said. Sure enough in a lot of catalogs and magazines it's been hard to not notice the infinity scarf. I have been so excited about making one for myself and here it is! 2nd Rnd: *YO, K2tog*, repeat * * to marker. 4th Rnd: *Slip 1, K1, Pass Slipped Stitch Over (PSSO), YO*, repeat * * to marker. Repeat 4 rows until desired width. My scarf measures approx 60 inches around and 10 inches wide. For a chunkier, cowl like version – check out the Fifth Avenue Cowl! ETA: With the huge popularity with this pattern I though I would write a quick note to help those having problems. The number of stitches never changes throughout the pattern. Each K2tog is paired with a YO (as each Slip 1, K1, PSSO is paired with a YO) if you find that you are increasing or decreasing your stitches in anyway then you missed or added a YO. In Row 4 you should be slipping the knitted YO from Row 2 and knitting the knit stitch. In Row 2, you should be inserting your needle first into the knitted YO then the knit stitch for your K2tog. I hope this helps and I'm really truly humbled and excited so many are making one! The scarf is so versatile. It's long enough to wear it all cozied up around your neck or just draped low. You could also wrap it around your head like a hood when the weather really gets cold. Not to mention the yarn is luxuriously soft! The only thing some people working with the dark Worsted Canopy may notice is that the yarn bleeds while you work with it. I got to see the Kelbourne Woolen ladies yesterday at Rheinbeck (SO FUN by the way!) and they said the dye is set it just needs an extra soak. I plan on making many more for friends and family especially with the holidays coming up! And now that you know what to do Go cast one on rightthisveryminute! Why do you need more than one size 8 circular needle? What about binding off? How do you finish the scarf? This Cowl is absolutely beautiful!!! I could not find one this nice, in a worthy yarn, to buy. Sometimes they look nice, but the yarn is just unacceptable. Yours is just classy!!! Thank you SOOO much for sharing your gift with us! I REALLY appreciate it! wrap it around my neck a couple of times. Thanks for sharing.. It is a real beauty.. In row 3, for an easier motion (faster) you can do – K1*YO,SSK*. Because it is a decrease that slants in the same direction, it looks identical to the SL1,K1,PSSO- but it goes faster and doesn’t cause hurt wrists as quickly. Hello, I am currently knitting this scarf. Very beautiful, but some difficulties are arising: when you say«In Row 2, you should be inserting your needle first into the YO then the knit stitch for your K2tog» I don’t understand. You knit from the row 1, which is knitting all the way: can you explain? also, any good way of keeping counts of the 241 stitches without having to recount after every row? thank you so much for anwering! I don’t want to make this scarf in the round. For an 8″ wide scarf joined at both ends, how many stitches would I need to cast on? This is so so pretty! 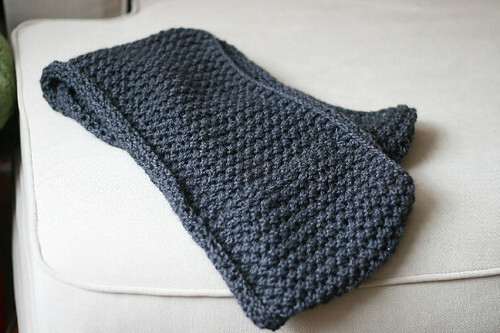 I think it will be my next project after I finish the Mac & Me ‘Babushka’ scarf. Thank you so much for sharing this pattern with us. I am new to knitting how many stitches do you cast-on for this scarf? I apologize if it is included and I did not see it. Amazing post shared by you here regarding scarf. I like your scarf pattern with beautiful color. Great job done by you. Thanks for sharing this nice pattern with us – I just finished my scarf yesterday and got loads of compliments from people that are around me. But the credits are yours! Big thanks from Austria! Being new to knitting this has turned out to be a nice easy pattern. I cast on 140 to make it more the size for my 5 year old in her favorite colours. Just confirming that you cast on 300 stitches based on the 20 stiches over 4 inches and you made a 5 food scarf… How is it for stretch? Does it remain stretched out if you wrap around your neck and head or does in nicely go back to knitted form once taken off? I just LOVE this pattern – thanks for creating it! Wonderful pattern, thanks for sharing! If you were to make it shorter, so as to not ever double it, how much shorter would you make it? 30 in? 40 in? I don’t knit but I crochet, how do I transfer this pattern to crochet it? I seriously LOVE this, M! Amazing job! I want one!! xo-S. The infinity scarf pattern’s gauge and number of stitches doesn’t add up to 60 inches. What am I missing? Hi, I know this was posted a long time ago, but I just found it while looking for an infinity scarf pattern (great pattern, by the way!) and I absolutely fell in love with the color of the yarn. Do you remember which color this is by any chance? I’m having a hard time figuring it out by looking at colors online. Thanks so much! Hey I really loved the pattern but when I made one myself it came out two times the size and I’m almost positive I followed everything correctly. Was there a special way that you yarned over or slipped your stitches that may have differed from what I did? I slipped purl wise and I yarned over going from underneath to over my right needle. Did I do something wrong? If you know what happened could you email me at a.fagan93@yahoo.com. Thanks so much! I really love making this scarf, I’m on my 7th one! Thank you for this pattern! 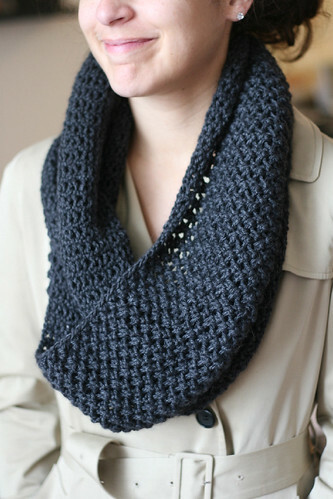 hello im new to knitting ( only knitted a basic 2 knit 2 purl scarf before this ) and im attempting to do this! was wondering if there is a size? if i make this for a guy, will 240 stitches be wide enough for his head? thanks so much!!! About how long did it take you to knit??? This is beautiful thank you for sharing the pattern. I’ve tried a couple of times to start this scarf and can’t seem to get the pattern correct. Then I saw it mentioned on another website and it mentions casting on 241 stitches. Should I be casting on 240 or 241?? Becky – 240, or any even number if you find your cowl is coming out bigger than expected! Stephanie – Lima would be lovely! Tell Linda I said hi! Hi. I’ve just discovered your pattern and love it. I noticed you mentioned that the number of stitches never changes but when I start the 4 round pattern it says to YO and then k2tog and then another YO. So, am I knitting 42 stitches for the entire scarf (original cast on was 84)? I’m so confused. Hi again. Please ignore my previous post. Figured it out. I was reading YO but thinking slip one!!! Thanks again for such a great pattern. Hi, I would love to make this scarf but I can’t use the Canopy as I am allergic to wool even a little bit. What other yarn can I use? Thanks for the great pattern! One question – how do you join another skein of yarn without it being obvious? This is a very classy infinity Scarf. I could wear it with a suit.